Scholars have tried for centuries to get in touch with the powerful dynamics that were occurring in the months that followed the resurrection of Christ. The emotional and concerted energies of hundreds of believers led to a revival of which over the centuries, many have sought to replicate but has never been duplicated. The messages of Jesus, as penetrating and life altering as they are, were not the only catalyst which drove the primitive Nazarene Ecclesia in its great evangelical thrust. The “primitive Christians” at that time were in the process of developing their Jewish sect within the entire economy of the Jewish life in Roman Judea. To them, they were to transform their Jewish way of life, culture and politics. This transformation was induced not only with the permission but the command to “Go ye therefore and teach all nations” was about as rapid a paradigm shift in religio-political culture as has ever been seen. The central cultural thesis in Judaism was that the world would come to them to learn of the majesty of the Hebrew God not realizing that they were about to reach out in the first and most powerful thrust in making the Hebrew monotheistic God into a Universal God for all mankind. The participants in that Pentecostal experience had no concept that what they were about to do was far more than a major reformation of Jewish life. They were still Israelites at heart and they knew that their primary mission was to take the “good news” to the “lost sheep of the house of Israel.” Their ancestral brethren in small tribes and groups had been separating themselves from the main body of Israelites even before the Exodus. The largest separation had been with the forced emigration of the northern ten tribes by the Assyrian warlords. The most recent had been the schism between the Samaritans and the Jews. The central core belief that is critical to understand is; on Pentecost, 30 CE the disciples and associates of Jesus firmly believed in their minds that Jesus had risen from the dead and had ascended up into heaven, yet in their minds this assent was only temporarily. He would come again and in this generation. Even more so, in reference to the future Messianic Age, when the followers of Jesus will be resurrected, it was still nothing more than a restoration of life as experience in the present world, yet with some difference, it might be a more glorious body, or a life of longer duration or potential immortality. When the disciples saw that the tomb was empty, it was one of incredulous disbelief. In spite of Jesus repeatedly telling them that He would rise again, we find the Galileans fleeing and heading back to the Sea of Galilee. To them, their life was a failure, Jesus was dead, and now his body had been stolen. Besides that they were being blamed for stealing the body. (Quoted from the Gospel of the Hebrews by Jerome, Of Illustrious Men, 2 found in The Pentecost Revolution by Hugh Joseph Schonfield, The Story of the Jesus Party in Israel, AD 36-66, Macdonald and Janes’s, St. Giles, 49/50 Poland Street, London, W.I., 1974, p 104). What a testimony this is on the nature of the state of the dead who sleep awaiting the resurrection by their Lord. It could not have been a more memorable moment when on the Feast of Weeks, Pentecost all the friends and disciples of Jesus were celebrating the festival of the first-fruits. That they were all Jewish and fully immerse in the life of Torah must truly be accepted to understand fully the implications of the actions and reactions that would come over the next decades. Here we see the proclamation of the literal resurrection of the Messiah was to become a literal image of a still future literal event, the resurrection of the elect or Holy Ones. Did not Paul, known as the Pharisee Rabbi Shaul say? Do we have a hint or a clue that it was the downtrodden and the youth of both genders, who would receive the most noticeable portion of the spirit, for if you are to prophesy, you must also speak your prophesy in public and do so in public. From this, the New Testament’s greatest evangelistic campaign in Jerusalem, three thousand responded to Peter as he “pressed his case” with the plea, “the “Repent and is baptized”. The city of Jerusalem was astir, as one author said, “seething”, in anticipation and expectation. Their hearts were open, for the seed had been sown for three and a half years by the “Son of man”, and now in league with the “Spirit”, the harvest was being reaped. It’s important to understand, the Pharisees and Sadducees as major parties could only number about seven to eight thousand adherents each, and with the Essenes, the number was slightly less. Three thousand added in one day to the new “Party of Jesus” called “The Way” was a major religious and political event. Many may have come from the general population and the Diaspora Jews, yet when we soon look at the structure of the Jerusalem Church, we will see a strong influence from the organization and polity of the Essenes. The people in Jerusalem were very much affected and supportive of the followers of Jesus. These Nazarene believers were pro-messianic and were expecting the future redemption of Israel by their rising messiah. They were not elitist and many were directly associated with the rank and file of the ordinary Jewish population. The core believers of Jesus cared deeply for the poor, the oppressed and the down-trodden and as staunch believers in the Law of Moses, they remained apart from the appearance of contact with heathens or heathen customs. On the other hand, the messianic message of the early Nazarenes was also attractive to the more radical zealots who had a political agenda to promote. The zealot guerrillas or the messianic ‘underground’ who could respond suddenly to the fanatical ideology of a prophet (false) or aspirant to the throne of David, would forever link the early primitive Christians to the radical fringe which eventually brought Judea to her knees and the destruction of Jerusalem. The release of Peter and John from the garrison of the temple guard was a political victory to the primitive followers of Jesus. Their “approval poll ratings’ sky-rocketed. Another five thousand believers were added to the Community of Jesus, including many of the priests who lived in the Ophel, many Jews living in the Diaspora, and many Gentile Hellenistic believers. Keep in mind the potential threat this was to the leading Jewish authorities. Once again Peter and John had been arrested and these times were imprisoned until a full Sanhedrin could be convened. Before they could be brought to trial, the release of Peter and John was known throughout the city. Were these white cloaked emissaries supernatural beings or were they part of the white robed Essene underground? (Acts 5:17-21) They in turn were now escorted back to the Sanhedrin, though not in chains, for questioning. Though the Sadducean hierarchy wanted their execution, it was the defense of the great Pharisaic teacher, Rabban Gamaliel, who was the urged their caution, least open rebellion be incited, led the two apostles to be flogged and released, with further warnings. With nine thousand new recruits to the Messianic Church of Jesus, the Hebrew Nazarenes were becoming the dominant sect or party in Judah. With the large league of priests whose home was in the Ophel district of Jerusalem did truly become followers of the Jewish messiah; Yahshua was a direct testimony that the Hebrew Nazarene Ecclesia of Jerusalem was fully Jewish. As true orthodox Jews, they strictly obeyed all the 613 Mosaic ordinances given to Israel at Sinai. These priest continued to minister in the Temple. It was their predecessors who formed the consciousness of Jewish society. For two hundred years prior to the birth of Yahshua, they attacked the Hellenistic lifestyles of the priestly families and formed the Chasidism, who later became the Zadokites (priestly members from the family of the High Priest during King David’s rule) and Essenes, who strictly believed that the current priestly rulers from the family of Annas and the Boethe were illegitimate priests and the true Zadoks were to be the only God appointed priests. It was here that the polarizing alignment began between the pro-Messianics and the anti-Messianics. This rift would be the central fulcrum of Jewish political life until the destruction of Jerusalem. This rift would eventually define the Jerusalem Nazarene Ecclesia, known in Acts as the Jerusalem Church. The date when the Jerusalem Nazarene Ecclesia was formed is unclear to modern historians. With the rapid growth of the Nazarene party and the evangelistic fervor that came with it, only suggests that an organizational structure was needed and needed immediately. What is known is that a supposed group of uneducated Galileans suddenly develop as sophisticated religious organization and began to compete for as the dominate party of the Jews in the decades after the death and resurrection of Yahshua. Yet who were these Nazarenes, who claimed to follow the teachings of a Jewish rabbi called Yahshua the Nazarene who preached and healed the sick in Galilee and Judea? His gentile Greek followers would later call him Iesus which would later be transliterated into English as Jesus. That these Hellenistic followers were later called Christians has been one of the most confusing facts in the growth and development of the Primitive Apostolic Ecclesia, called by many the Jerusalem Christian Church. That the church was called ‘Christian’ in Jerusalem defies the fact that there was never was a church in Jerusalem in that day, even though this fact has been declared irrelevant to most orthodox Christian scholars. Yet to blend the two; Christian and Nazarene formed a new reality that was historical, the Early Nazarene Ecclesia in Jerusalem was Jewish to its very core. Though some of the authors of the New Testament spoke and wrote in Greek, they thought in Hebrew and Aramaic. To take a meaning from the Classical and Hellenistic sources of Greek and superimpose these meanings upon the New Testament begs the idea that a proper historical context is missing. With the knowledge now gleaned from the Dead Sea Scrolls, we now know that the concepts and ideas of the Essenes flowed throughout the messages that Jesus spoke during his Galilean ministry. The Essenes were also the guiding spiritual leaders and thinkers during the prior two centuries in the development of eschatology on the time of the end. This coming would be associated with a spectacular apocalyptic ending, when, the anointed one, the messiah would return to claim his own people. That eschatology that that is now believed by millions of modern Christians, that believe that Jesus is returning in a literal second coming, is found amongst Adventists, Evangelicals and Messianics. Their spiritual roots will be found in the villages and communes of the Essene brethren, called the ‘Elect’. The communal organization of communism, founded in the villages and communities of the Essenes has been the source of inspiration even down to the eighteenth century utopian communities. This type of utopian community was noted especially in the Shaker communities, who grew out of the same religious revivalism that gave the roots to Millerism and early Adventism. The scriptural testimony is strong and clear; Jesus did have siblings. Yet the hints we recognize are meager. We read in Acts that after the ascension of Jesus on the Mount of Olives, the friends and disciples of Jesus met again in the house with an upper room. With them were the women who had followed and supported the ministry of Jesus and also with them were the mother of Jesus and his brethren. (Acts 1:13-14) Who were these brethren and what was their relationship to Jesus? The New Testament records five times in which “the brethren” of Jesus are mentioned. 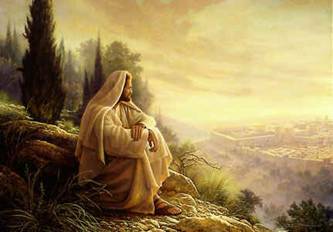 Matthew 13:55 - “Is not this the carpenter’s son? Is not his mother called Mary? And his brethren, James and Joses, and Simon, and Judas? (2) Symeon (Simon), son of Cleopas, nominated to be the replacement leaders as head of the Jerusalem Nazarene Ecclesia upon the death of Jacob the Just in 63 CE. The first clue to this organization, we have is found in the Gospel of Thomas, (Saying 8). This gospel or collection of saying of Christ is accepted to be a very early book of Jesus’ teachings attributed to the writings of the Apostle Judas Thomas. It was preserved in the library archives of the Gnostic believers at Nag Hammadi in Egypt as one of the earliest Coptic manuscripts known to this day. Portions of this book also were found in the 19th century in Egypt at Oxyrhychus. The Lucian account in Acts of the Apostles, confirms that the apostles and disciples in one accord placed themselves under the leadership of James the Just, known as the brother of Jesus. Who was this person, Jacob, held in such high esteem, who became the undisputed leader even over all the other disciples? The Christian world was essentially clueless to the man called Jacob or James the Just, who was the brother of Jesus and became the first leader of the fledgling congregation of insecure believers who were still reeling over the death of their beloved rabbi. Many had become convinced that Yahshua truly was the promised messiah, but what His messianic mission was they were unsure. The resurrection and the phenomenon that was associated with the nature of the Risen Christ was enough to convince most that they were in the presence of an other-dimensional being who He represented Himself as the Son of the God of Abraham. Ya'akov bar Yosef akhui diYahshua, saying, "James, son of Joseph, brother of Jesus." The news ricocheted around the world and immediately the scientific world was polarized as they always do when new evidence emerges of an authentic artifact of either the ancient Israeli or Jewish origins. Quickly the newsprints and airways were crying fraud and deception. 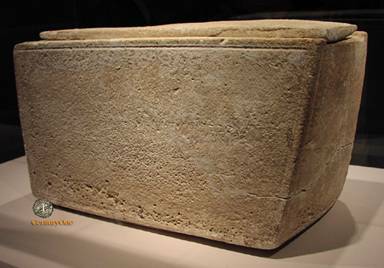 The ossuary is owned by an Israeli antiquities collector Oded Golan, who is the owner also of a stone tablet reputed to have been written in the reign of King Josiah of the Kingdom of Judah. Mr. Golan claimed that he purchased the ossuary, currently valued by experts to be worth about two million dollars, in the mid-1970 from an antiquities dealer who name is now not remembered in the Old City of Jerusalem for about $200. According to Hershel Shanks, editor of BAR, "The Arab dealer told the owner it came from Silwan, a Jerusalem suburb honeycombed with ancient tombs. The ossuary was soon after its discovery was sent to a convention of biblical scholars and the Royal Ontario Museum in Toronto put it on display. While in route, it developed a series of cracks. The experts on Hebrew linguistics and ancient scripts were immediately divided. The burial box was obvious to all to be genuine. It was accepted that it was part of the Judean burial customs between 20 BCE and 70 CE when Jewish remains lay in long caves for a year until the flesh decayed and fell off and then the bones were placed in a limestone ossuary bone and put in a cave. 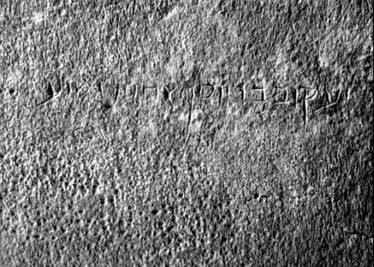 The first part of the inscription, ‘James son of Joseph’ was felt by most to be genuine but the second half of the inscription, ‘brother of Jesus’ bore the marks of a fraudulent additions to possibly around the 3rd to the 4th centuries CE. Andre Lemaire, a specialist in ancient inscriptions at the French Practical School of Higher Studies, published his finding in the Nov/Dec 2002 BAR that the writing and script was ‘very probable’ authentic and could be dated to about 63 CE, the date of the death of James the Just when he was stoned, clubbed and then thrown over the parapet of the temple walls to the Kidron valley below. Lemaire estimates that in that era of ninety years about twenty James who could have had a father called Joseph and a brother called Jesus would have lived. On the other hand, Robert Eisenman of California State University, author of the massive book, James the brother of Jesus, attacked the authenticity of the ossuary. Eisenman, a critical skeptic who thinks that “Jesus’ existence is a very shaky thing’, finds the find ‘just too pat. It’s just too perfect’. Until the archeological finding of the ossuary, the oldest artifact that has survived and has been recovered that mentions the name of Jesus is a fragment of the 18 chapter of the Gospel of John that was found in a manuscript discovered in Egypt in 1920 and dated to about 125 CE. Though most modern scholars date the earliest gospel, Gospel of Mark, to about 70 CE, yet this author feels that the Gospel of Mark was written as early as 55 CE in the city of Rome where Mark was assisting the Apostle Paul just before his execution in the circus of Nero. Later in the 2nd century there are numerous manuscripts of the New Testament and three pagan authors in Rome in the 2nd century and the writings of Josephus during and after the fall of Jerusalem in 70 CE comprise all the earliest evidence of Jesus the son of Mary. Outside of the few biblical statement in Acts, the major sources on the life of Jacob (James) the brother of Jesus, are found in The Gospel of Thomas, The Gospel of the Hebrews, Hegesippus, Clements of Alexandria, Julius Africanus, Origin, Eusebius, Jerome and Epiphanius. 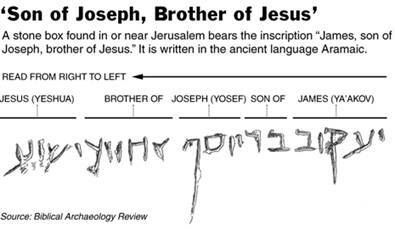 A review of these sources gives us this image of Jacob (James) the Just, known as the brother of Jesus. Eusebius, Ecclesiastical History - “Now Jacob the brother of the Lord, who, as there was many of this name, was termed the Just by all, from the days of our Lord until now, received the government of the Community with the apostles. This apostle was consecrated from his mother’s womb. He drank neither wine nor fermented liquors, and abstained from animal food. A razor never came upon his head; he never anointed himself with oil or used a public bath. He alone was allowed to enter the Holy place. He never wore woolen, only linen garments. He was in the habit of entering the Temple alone, and was often to be found upon his knees and interceding for the forgiveness of the people; so that his knees became as hard as a camel’s …And indeed, on account of his exceeding great piety, he was called the Just (i.e. Tzaddik) and Oblias (i.e. Ophla-am), which signifies Justice and the People’s Bulwark; as the Prophets declare concerning Him.” (Eusebius, Ecclesiastical History, II. i as quoted by Hugh Joseph Schonfield The Pentecost Revolution, The Story of the Jesus Party in Israel, AD 36-66, Macdonald and -Janes’s, St. Giles, 49/50 Poland Street, London, W.I., 1974, p 147-148). Now Clement of Alexandria was quoted also by Eusebius that James the Just, Peter and John were part of an inner triumvirate that Jesus gave ‘higher knowledge’ before He ascended into the cloud. Yet the tenor of the passage suggests a man of great piety and a true tzaddik or righteous man amongst his people. That he was a Nazarite is true. This was a vow since his birth. That he was a Nazarene is also true as he and Jesus both probably came from the same childhood village that very well may have had an Essene village associated with it. Yet what is even more profound, James (Jacob) the Just was also a practicing Levite and allowed to enter the premises of the Holy Place, a room consecrated for the descendants of the House of Levi only. (See further the Jewish encyclopedia (Funk and Wagnalls) under Article. Simon the Just, as quoted by Hugh Joseph Schonfield The Pentecost Revolution, The Story of the Jesus Party in Israel, AD 36-66, Macdonald and -Janes’s, St. Giles, 49/50 Poland Street, London, W.I., 1974, p 147-148). It is rather to Hegesippus, we can credit a lot of the facts concerning the early Nazarene Church that are not found in the record of the Acts of the Apostles and other contemporary sources on the early Nazarenes in Jerusalem. Hegesippus was recognized as one of the earliest Church historians, who traveled extensively and collected every bit of information he could on the historical roots of the Nazarene and Christian communities. Many have called him the “Father of Early Christian History”. Here is the picture of James the Just as gleaned from multiple historical sources. These includes that he was the first born of Joseph and dedicated to be a Nazarite. This vow in his instance was life long, including being an ascetic, one who was very pious and benevolent to the poor. He served the role as intercessor for his people, and being so long on his knees, it was claimed his knees were like ‘camels’. His name attributes, suggest that that he stood for justice and was recognized as a “Tzaddik”. He was extremely popular and drew vast throngs. He was called ‘Supreme Commander” and also “Lord Jacob”. He was especially identified by the Lord as receiving the ‘Gift of Knowledge’. 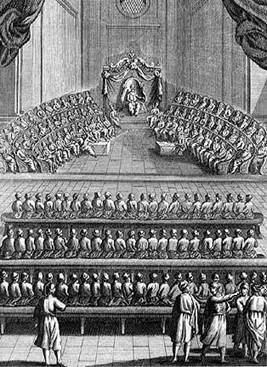 It soon became apparent, at least by 34-35 CE, that the central church needed an organization to deal with the conflicts such as the Greek adherents to the faith and how to provide for the Greek widows, as well as how to deal with the gentiles who wished to be admitted into the church. The models used for the organization of the Nazarene Ecclesia were apparent, the Essene structure, Jesus ministerial organization (Luke 10:1), the Mosaic model (Numbers 11:16-17) and the Sanhedrin. Chief Office of the Religious Court was called the Ab Beth-Din. Yet this was also adapted closer to the model of Jesus’ ministry, in which the three leaders, Peter, James, son of Zebedee, and his brother, John were part of the Twelve. In the Nazarene Congregation, the “pillars” as Paul called them, were Peter, James (Jacob) the brother of Jesus, and John. The Apostle Peter became the Chief Officer of the Religious Court (Ab Beth-Din), or the general supervisor, the chief propagandist or evangelist (fame at Pentecost) and pastoral director. About the age of thirty one, James the Less quickly emerged as the leader of the Jerusalem Nazarene Church. This leadership was recognized most in the writing of Paul and Luke (Acts). It was to James and to Peter that on several occasions when he would return back from a mission experience; he sought private audiences with these two Apostles. Later, Paul mentions James (Galatians 2:12), when the ideological battle arose in the Nazarene Ecclesia on whether congregational membership (salvation) could be extended to those who were not circumcised (Acts 15:13).